Daryl Dixon: [holds up the dead animal] We brought dinner. Aaron: It's okay. Come on in, guys. Nicholas: Before we take this any further, I need you all to turn over your weapons. If you stay, you hand them over. 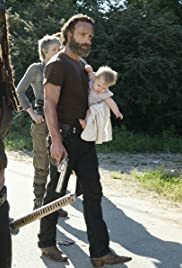 Rick Grimes: We don't know if we want to stay. Rick Grimes: If we were gonna use them, we would have started already. Aaron: Let them talk to Deanna first. Rick and the survivors arrive at Alexandria in need for safety.